Do the job – proofing is different from reviewing. If a proofer gets too caught up in making big-picture content or organization suggestions, it’s easy to overlook the small stuff like typos or missing punctuation. That’s why it’s important to know which task you are assigned and stick to it. Proof the complete document, from headline to boilerplate. It’s natural to take your eye directly to the body of content, but this can mean accidentally missing mistakes in a header or title page. Similarly, if you’ve seen a boilerplate many times, it’s tempting to just skim it. But putting focus on the entire document, start to finish, is a must. Print it out. A good old-fashioned hard copy is the best way to spot formatting inconsistencies or small errors like an extra space. Know copy editing symbols. You can’t make the needed changes if you have no idea what that symbol means! We use consistent editing symbols to make it easy on both the proofer and the author. Make proofing marks easy to spot. Ever missed a tiny edit made in black ink? I sure have! 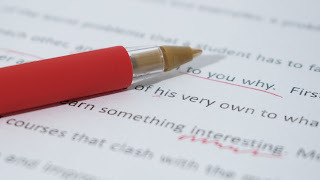 We ask proofers to use a different color and ensure edits are visible by flagging with a check mark, or even Post-its if the document is very large. Be respectful of others' time. Proofing takes time, so we need to make sure to allow plenty of it. While there are always tight deadlines that require an immediate look, we try to let proofers take their time with documents to avoid mistakes. Rely on new eyes. It’s very hard to see the details in something you have already reviewed multiple times. Whenever possible, we want the proofer to have a “fresh” look at the document, so they are more likely to find those hidden issues. Don’t let anything slide. With moments to go to deadline, it can be tempting to let a small error slide. But when perfection is the goal, you must make note of even the smallest mistake. On many occasions we have reprinted or rebound stacks of materials because of a “tiny” typo. A little extra effort is worth the fix when our reputation – and the reputations of our clients – depend on it. Take responsibility for the document. Proofing is a real job at LCWA – so real that we require proofers to sign off on their work and take accountability for it. Our team members know they are playing a role in delivering high-quality work, and they take that seriously.